LANSING, Mich. (PAI)-Amid uproar, protests, confrontations, arrests, a temporary lockout of workers from the state capitol building and a Democratic walkout, the Republican-run Michigan House passed a so-called “right to work” law on Dec. 6. The tea party-influenced GOP swung quickly into action after Republican Gov. Rick Snyder, earlier in the week, dropped his opposition to the anti-union anti-worker bill and after the state Chamber of Commerce endorsed it. The GOP-run state senate was expected to pass the bill by Dec. 11 and send it to Snyder, who will sign it. 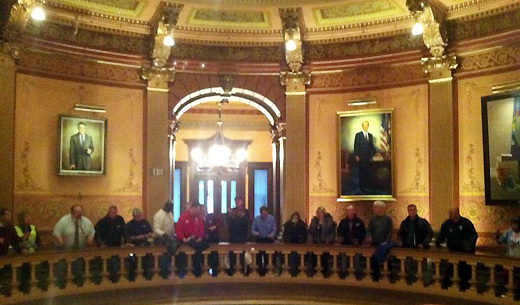 Unionists from all over the Wolverine State converged on the capitol building in Lansing to protest and lobby lawmakers. When unionists arrived on Dec. 6, they found Snyder and the GOP had locked them out. A local judge later ordered the capitol opened, the American Federation of Teachers said. Confrontations broke out all over the capitol grounds, with state police pepper-gassing unionists and arresting at least 14. Inside the building, the House Democrats, angry with the GOP’s railroad tactics, walked out en masse before the vote. When they returned, they opposed the right-to-work bill, which passed 58-52. Union leaders put out calls statewide for activists to come to Lansing. “Right to work,” which would strip unions of the power to collect dues from all workers covered by a particular contract, has been a favorite right wing-business cause for decades. “There are some basic economic facts that should inform any thoughtful discussion of Right to Work legislation,” state AFL-CIO President Karla Swift added. “Workers, union or nonunion, make an average of $1,500 less per year in Right to Work states. 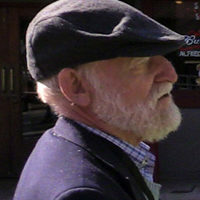 They are also less likely to have pension or health care benefits,” Swift noted. She also said RTW states grow more slowly. Action: Tell Michigan’s Gov. Snyder that this anti-worker bill is wrong. Sign this petition against RTW or call Gov. Snyder at (517) 373-3400. There will also be a rally on Tuesday in Lansing. Supporters will be gathering at 9 a.m. at the state Capitol. Please check the Michigan AFL-CIO Face Book and Twitter pages for updates over the weekend. Photo: In Lansing, alleged overcapacity still keeping citizens out of their Capitol. Chant erupts in the rotunda: “inside, outside, we’re all together”. Michigan AFL-CIO Facebook.